Nowadays push notifications have gained great popularity and are widely used by app providers for their app visibility. Once the app is properly developed and is out in the market for use, it is also important to promote the app using some marketing techniques. Push notification has become one of the major techniques of app marketing. They are already in use and giving amazing results to the app developers. From time to time it is crucial to remind users about the app features and uses. To increase the rate of app retention and to increase user engagement it can be beneficial to use push notifications. Let users feel the touch: It is good to add a personal touch to your push notification. Be active in generating geo-data and targeting users according to their location. Follow the sequence and choose the best time to send notifications. Do not send regular notifications nor in large quantity as this may annoy users that may end up in deleting the app. Push notifications, not a scam: There are numerous ways to use push notifications such as' You are away from too long' or 'Don't forget to check-in today' but do not end up in sending spam push notifications otherwise you will be out of the app competition. Quality always preferred: Be focussed and plan to make your message qualitative. Quantity does not matter so do not line up the list of your messages only because you have an option. Mix but not shake: Send the mix of push notifications. Don't convey the same message in the form of multiple texts. Users are smart and they can get you the very first time. Be moderate: Keep in mind the statistics and do not send messages too often. There is no exact number that can help you. It is absolutely your job i.e. the data collection, analysis and determining the perfect threshold for your app. Be precise: Try to deliver valuable information in a precise form. Your message and related links should be transparent and absolutely clear. 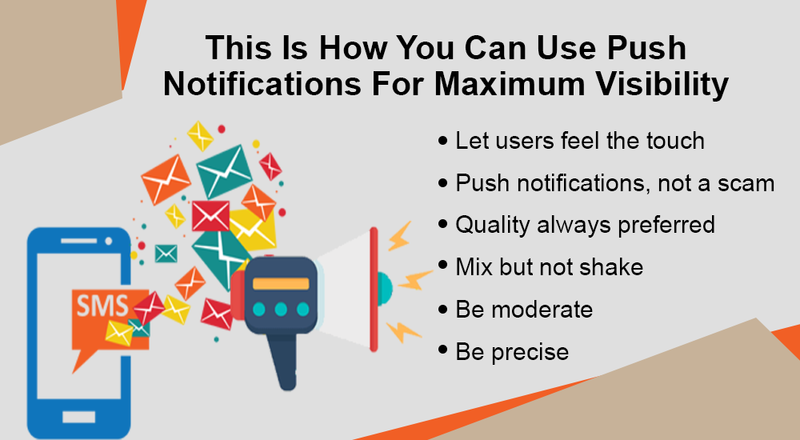 If you are searching a reason that how to use push notifications for maximum visibility then visit (Bestsmscompany), for complete information.